We first noticed the dwarfs when Mathias almost tripped on one Sunday afternoon. 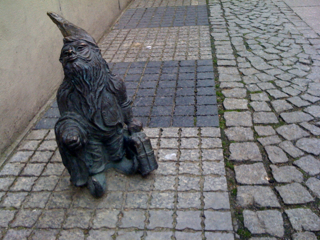 At the tourist office this morning I read about dwarfs all over old town so when we got back to the hotel (we where meeting Rosana and Maciej here at noon today) I searched a bit online about it. 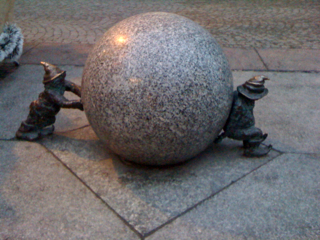 Turns out there are around 50 dwarfs spread around the old town depicting the Polish people in different social and cultural situations. 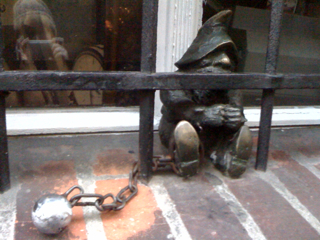 So, after lunch when we walked around the old town we went dwarf hunting and now we’ve found 11 dwarfs in total. See pictures below.